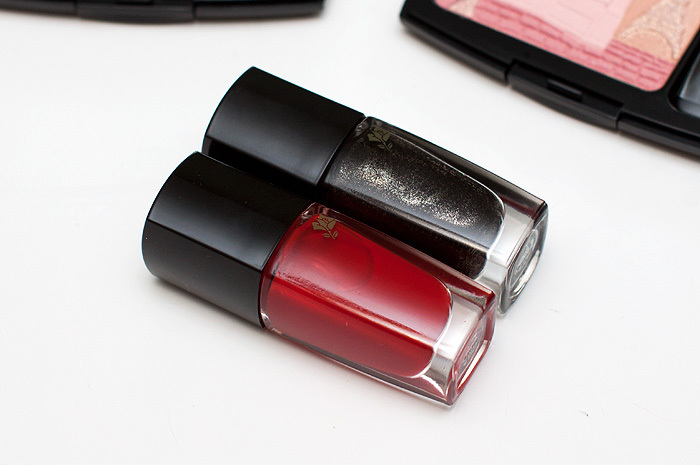 To complete the Fall collection, Lancome will release two new nail polishes in classic red and edgy black. 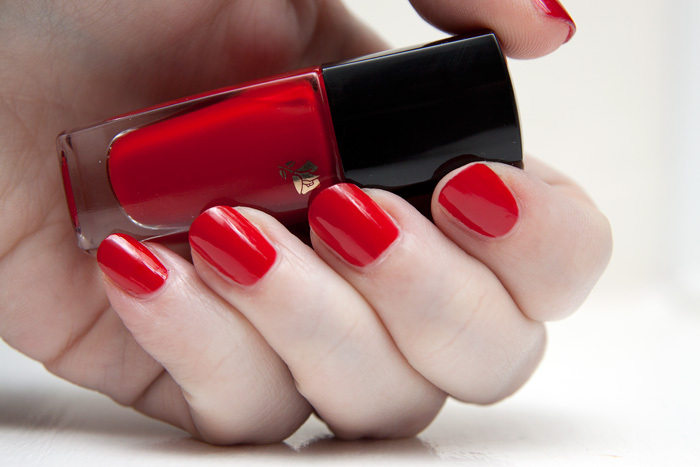 The red – #22 Rouge St Honore is a classic, vixen red creme with great single-coat opacity and a high gloss finish. The brush on these polishes is wide and allows for 3-stroke coverage, meaning that I was completely done with the red in less than 5 minutes from start to finish (not allowing for drying time of course). The black – #29 Noir is a little more unusual in that the inky base is infused with mini, multi-coloured flecks. Sadly, these don’t quite translate as vividly on the nail as they do in the bottle. Also a little sheerer than the red, this one took a respectable 2 coats to achieve opacity. Naturally I love the black – seems out of character for Lancome, in a good way! I have been wanting to see the black up close, thanks for showing that! It’s so pretty! I love the black in the bottle, but not sure on the nail. The red though, will be mine! That black is very pretty! 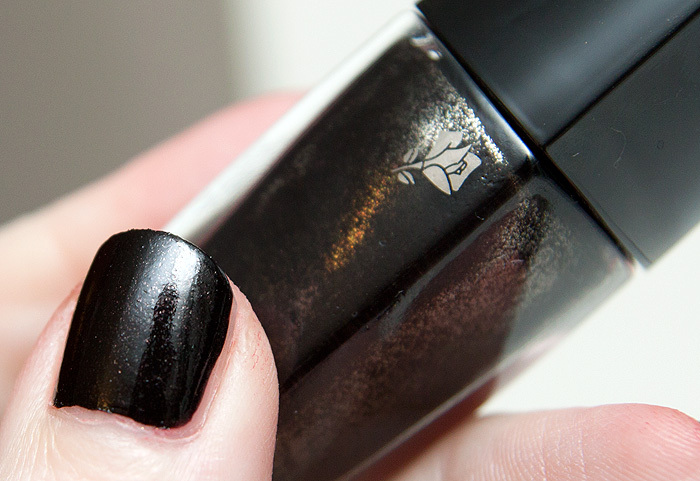 I Love that black with the silver glitter its gorgeous! That is my idea of a perfect red – creamy, clean and bright. Honestly, i think people often overlook how nice red nails can look! 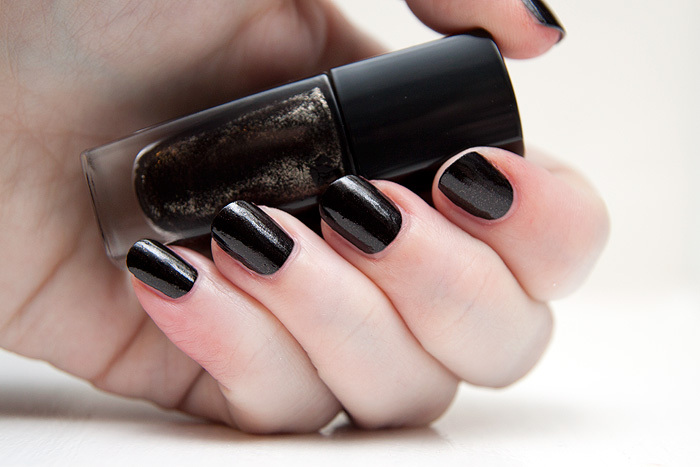 Love the darker shade too but this is the kind of shade that i’m never satisfied with when i paint it on – it never looks as glam on me as it does in the bottle. After what I said about the black, I bought a very close shade called Beautifully Black by No.7 and have been wearing it since! I like the black one, very similar to L’Oreal Titanium Shine and resist in 735, luckily I have that so no need to splash out on Lancome! Red Lipped Readers - Part Eight! Reveal yourself in RED with the new Chanel Rouge Allure Collection! A CHEAP PRETTY THING FOR YOUR DRESSING TABLE! Treats to keep a dieter sane!